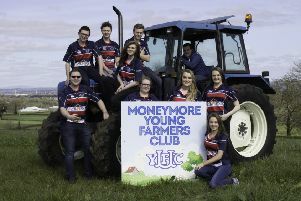 Rathfriland Young Farmers’ Club this year are celebrating their 75th year and what better way to kick off celebrations than by performing a 3 Act Play in their new club hall, Downpatrick Street, Rathfriland. This was the second three act play since the club hall was opened in 2015 and due to the success of last year’s play, the club were delighted when all the hard work over recent months finally paid off and they were able to put on yet another three act play this year. This year the play titled Family Fever by Sam Cree took to the stage from Wednesday, February 27 to Saturday, March 2. The event was well supported, with over 700 people attending over the four nights. The action of the play took place in the living room of the Gailbraith Family before and after Christmas and on New Year’s Eve. The cast, made up with a majority of active club members thoroughly enjoyed their time on stage with the play which also travelled the country to Irvinestown, Co Tyrone and Dromore, Co Down. Throughout the rest of 2019, the club look forward to many upcoming events, such as their sponsored 75km for 75 years sponsored cycle and their 75th anniversary dinner to be held in the Belmont Hotel, Banbridge on Saturday, October 19, 2019. Throughout the year a percentage of the proceeds from the celebratory events will go to the club’s chosen charity for the year, the Southern Area Hospice Services with a cheque presentation of accumulated funds being presented at the end of the year.